The Accélérateur Banque Nationale – HEC Montréal and the Shanghai Caohejing Hi-Tech Park Innovation Center (CHJ) have signed a partnership agreement. The agreement was signed during Canadian Prime Minister Justin Trudeau’s visit to China and the G20 Young Entrepreneurs Alliance Summit. The CHJ is the largest incubator and accelerator in Shanghai. It focuses on technological innovations and entrepreneurship in such sectors as green technology, video gaming, virtual reality and e-commerce. A number of companies that are today listed on the stock market, like Taomme (China’s leader in children’s entertainment), were incubated at the Shanghai Caohejing Hi-Tech Park Innovation Center. The co-operative agreement with the Accélérateur Banque Nationale – HEC Montréal is intended to create synergy between the strengths of HEC Montréal as a leading business school and those of a technology park like the one in Shanghai. “Our entrepreneurs will be able to spend time in both countries and draw on the resources of our respective institutions. We are also aiming to create mixed teams, i.e. to have Chinese and Quebec entrepreneurs start companies together,” says Luis Cisneros, Associate Professor and Director of the Institut d’entrepreneuriat Banque Nationale – HEC Montréal. The support provided by the two accelerators will help entrepreneurs find their way in both countries’ entrepreneurial ecosystems and understand their cultures. Both partners will be making their mentor networks available to entrepreneurs. Online training will also be offered for participating entrepreneurs. 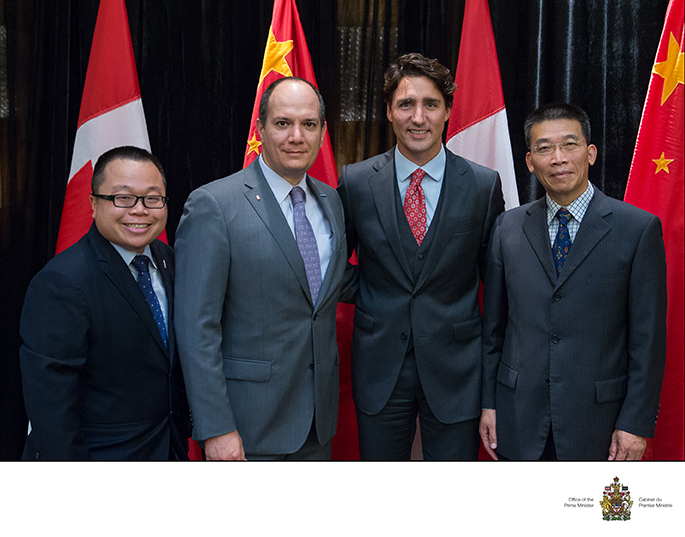 Left to right: Winston Chan (Canadian Sherpa-delegate to the G20 Young Entrepreneurs Alliance), Luis Felipe Cisneros (Director of the Entrepreneurship, Entrepreneurial Acquisition and Business Families Hub and Associate Professor with the Department of Entrepreneurship and Innovation at HEC Montréal), Justin Trudeau (Prime Minister of Canada), Han BaoFu (Deputy General Engineer, Shanghai Caohejing Hi-Tech Park). Photo: Office of the Prime Minister.